Home / Shop / Paint / Farrow & Ball / Primers & Undercoats / Masonry / Farrow & Ball Masonry & Plaster Stabilising Primer 5 litre. Farrow & Ball Masonry & Plaster Stabilising Primer 5 litre. For use on masonry, rendered or plastered surfaces which are porous, chalky or slightly worn. Farrow & Ball Masonry & Plaster Stabilising Primer will prep the surface for an even and longer lasting finish. Farrow & Ball Masonry & Plaster Stabilising Primer is for use on masonry, rendered or plastered surfaces which are porous, chalky or slightly worn. This primer prepares the surface for an even and longer lasting finish. 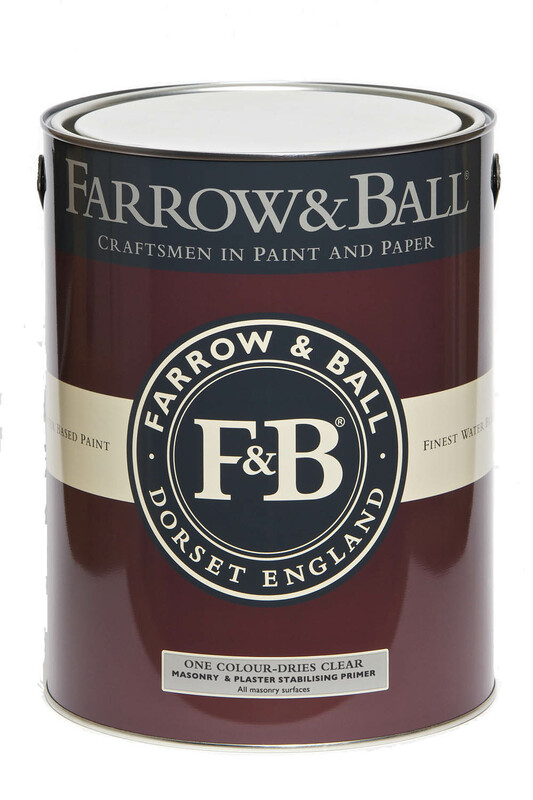 Farrow & Ball Masonry Primer can be used under Farrow & Ball Exterior Masonry, Farrow & Ball Estate Emulsion or Farrow & Ball Modern Emulsion. Looks white in the can but dries clear. View a Data Sheet for Farrow & Ball Masonry & Plaster Primer. We have had problems in the past when stripping wall paper it took off all the previous preparation right to the bare plaster. We have realised now that all the plastered walls in the house, built in the mid nineties, haven’t had a mist coat to seal the plaster. Hopefully now this will not happen again after applying Masonry & Plaster Stabilising Primer. Did exactly what it should. The product perfectly sealed a combination of old stone and new repairs to pointing ready for painting. We used it to great effect on a ceiling that was in poor condition. Had tried other products but this is the one that worked with no fuss or mess. We now plan to use it on some bedroom walls stripped to the bare plaster.